"Khana kahan se ayega Maa? Kya raat ka khana chhod de? Paisa bachega" (How are we going to get our food now? Should we skip dinners to save money? ), asked Sudha, Lilawati’s daughter. For the next few weeks, this was the only question haunting Lilawati. She murmured "Mai abhi bhi hun, hum bhukhe nahi rahenge" (I am still there, we won't be starving). In a year’s time, Lilawati would start a small movement in her farm which will become a trend among her fellow villagers and she would change the face of crop-basket, forever. A long stressful day of July 2016 was drawing to an end for Lilawati as she wrapped up sowing paddy saplings in her farm. She must have walked for about a couple of hundred meters when a frantic cry from her son, Bikram, who was running up to her, stopped Lilawati midway. "Maa! Babuji khatam ho gaye" (Father is no more). Bahadur Singh, Lilawati's husband, the principal bread earner of the family, died in a car accident that morning in Bokaro city of Jharkhand. He worked as a driver of a four-wheeler. Like several other farmer families of Kusmha village in Chakai block of Bihar where the husbands migrate for work, Lilawati being the wife took care of their farms. The day-long hard work in the field coupled with this shock left Lilawati unconscious. She collapsed. "Khana kahan se ayega Maa? Kya raat ka khana chhod de? Paisa bachega" (How are we going to get our food now? Should we skip dinners to save money? ), asked her Sudha. For the next few weeks, this was the only question haunting Lilawati. She murmured "Mai abhi bhi hun, hum bhukhe nahi rahenge" (I am still there, we won't be starving). The net additional income from her farm was a scanty Rs. 6,000 a year and she had no clue about how to increase her cash flow. Forty one year old Lilawati refused to give-in to her life situation and took the pledge of overcoming one of the most challenging times of her life. Staring at the setting sun, she whispered "main haar nahin manungi" (I am not going to accept defeat). Her fellow SHG members were a strong pillar of support during these trying times. Lilawati had read till class eight. Discussing in a subsequent group meeting she decided to take up the role of a Village Resource Person (VRP). As a VRP, she started maintaining records and collect data related to field activities. Lilawati earnt a remuneration of Rs 4,000, her first cash income! Soon, she got involved in a project initiated by PRADAN with support from Lutheran World Relief (LWR) conceived around livelihoods and nutrition. This was a golden opportunity for her. Lilawati enhanced her skills by participating in various trainings in agriculture and Integrated Livestock Rearing (ILR). The summer of 2017, saw the emergence of a very different Lilawati. She brought in seeds of vegetables such as tomato, chilly and bitter gourd that she was going to sow during monsoons. Later in the year, she grew green peas too. These were crops that none in Kusmha had ever included in their crop-baskets. Incurring an expense of Rs. 7,500 Lilawati earned a whopping Rs. 30,000 that year. In the coming seasons, she added eggplant and pigeon pea to her crop basket which allowed her a saving of around Rs. 15,000! Additional income started flowing in from her work as a village level trainer (VLT) of nutrition, something that she started doing as a part of the LWR project. Slowly but steadily, Lilawati was bringing stability to her life. In a country where more than 70 per cent of the rural population survives on less than Rs. 40 per person per day, Lilawati was making substantial financial strides. Seeing her success, her fellow villagers got also enthused to see their farms undergo the same transformation and earn similar cash income in return. They got engaged in tomato, chilly and eggplant farming using advanced agricultural tools and techniques that they had seen Lilwati adopt. When the local Mandi agents expressed their surprise on seeing a whole new range of vegetables, the farmers replied "Lilawati didi ne hi sikhaya hai, ab isme hi humara fayda hai" (Lilawati has helped us learn how to cultivate these crops, these are profitable for us). What started as a small movement by Lilawati, soon emerged as a growing trend with dozens of Kusmha families adopting large-scale cultivation of cash crops. For Lilawati, the size of her family had increased – in her words "Mera parivar sirf paanch logon ka nahi raha, poora gaon hi mera parivar ban gaya hai"(My household does not consist five members anymore; the entire village is my household now). The ever-rising expectations of her fellow villagers made her start an agricultural farm tool bank at her village under the same LWR project. This helped other farmers to access farm tools like the plough, axe, hand cultivator, cutter, etc. at an affordable rate. 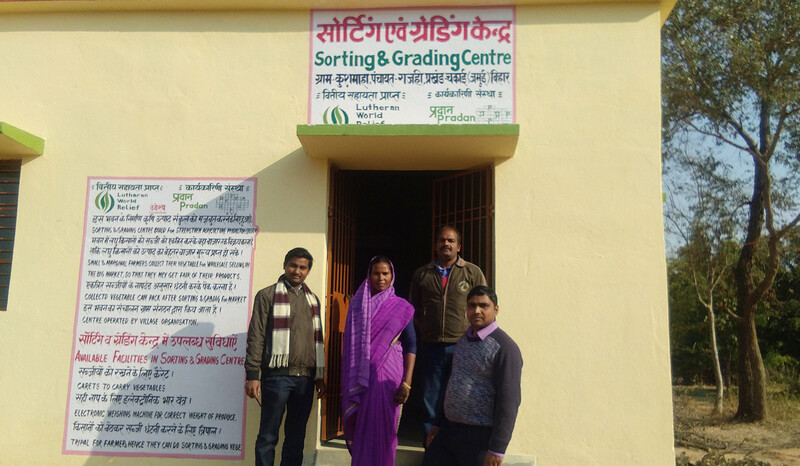 She also went on to donate her share of her ancestral family land (seven decimals) for supporting the building of a dedicated 'Sorting & Grading' centre of vegetables in the village. Until the year before last, Lilawati was living each day with great anxiety. Much of it was because the villagers never accepted a widow to assume the role of a farmer. But today, as she sees the entire fraternity accessing the tool-bank and the Grading-Sorting centre, a radiant smile adorns her face. After all, she has not only ensured food for her family, but for most of the other families of Kusmha. “Khana kahan se ayega Maa? Kya raat ka khana chhod de? Paisa bachega” (How are we going to get our food now? Should we skip dinners to save money? ), asked Sudha, Lilawati’s daughter. For the next few weeks, this was the only question haunting Lilawati. She murmured “Mai abhi bhi hun, hum bhukhe nahi rahenge” (I am still there, we won’t be starving).